After seeing the prototype-ui.I started doing some of the examples to be working with rails application.Now i have tried with Carousel. Carousel are great to display a large set of data like images. 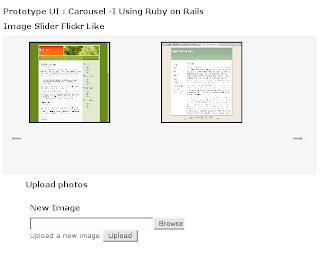 here i have tried to create Image slide show flickr like (Prototype UI : Carousel) with ruby on rails application. here i have used partials. under deafults we will be getting prototype & effects.